Copper wire spirals around a clear glass tube, accented with glass leaves and flowers, carnelian, moss agate, amethyst, aquamarine, rose quartz, garnet, and assorted glass beads. 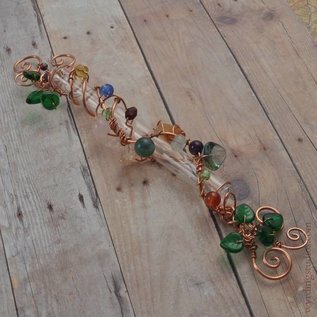 Copper wire spirals around a clear glass tube, accented with glass leaves and flowers, carnelian, moss agate, amethyst, aquamarine, rose quartz, garnet, and assorted glass beads. Hang it in your doorframe using small nails into the center of one of the spirals at either end. Created by Wyrding Studios in Concord, New Hampshire. "Wyrding Studios exists in a state of continuous evolution. It began in 2003 when I took up wireworking, became my full-time job on a folding table in a corner of my Manhattan apartment in 2005, and spent a year traveling the country in an RV before settling in New Hampshire in 2007. I have worked out of basements, bedrooms, on cross-country trains and kitchen tables. I sold jewelry online since before Etsy existed, and at last count I'd made well over 10,000 pieces of jewelry."